Also in Gannt chart view all dependencies are of the same color. Thus it is not distinguishable which tasks leads to which task. Make the color editable to make it clearly visible. @Tomas Gracias: Thank you for your feedback Tomas. We are keeping this in mind when we plan on our updates to the Gantt chart. @sebastian-grede: Hey there, Sebastian! I'm sorry to hear that you're hitting this issue. I've passed this along to the engineering team, and I'll let you know what I hear back! Hey there, everyone! We have made more improvements to Gantt recently that should have resolved these issues! Let me know if there's anything else I can assist you with, and have a great rest of your week! @Jorgen: Hi Jorgen. The statuses are still not displayed correctly. If i have Spaces with different custom statuses the Gant chart doesn't update the statuses that i can select based on the selection of spaces in the Gantt chart. Also When i select specific statuses in the board view these statuses are not auto selected in the gantt chart. I have reported this nearly 3 month ago and mentioned the issue here multiple times not sure why this has been marked as completed and also why it takes so long to fix this? @Sebastian Grede: Hey there, Sebastian! I apologize for the issue that you're facing with Gantt and the status filter. I have passed this along to the engineering team with an escalated priority and I'll let you know as soon as I have an update here. @Jorgen is there any update on the timelines not showing correctly? I opened this more then 3 weeks ago, and the timelines not showing correctly is a major issue and really irritating to work with! @Jorgen: I checked and the error only seems to occur in an older project. I created a new project with some lists and don't have the issue in that project. So you can discard that bug from my site it might be some corrupted database entries in your system. If it doesn't happen with new projects i am fine, as this project will be done soon. The statuses are still not updating correctly thought. @Jorgen: My issue was: I have added tasks only with due date and time, apparently not with a start time. When starting the GANTT in day view and then switching to hour view puts it on 23:00 instead of the set due time. Going to list, and then going back to gantt hour view directly they are listed OK, for a duration of one hour. @Ruud: @Sebastian Grede We have recently made some more improvements here. Could you give it another try and let me know if you're still having an issue? Let me know! @Jorgen: Looks to be resolved, at least the issue I was having. I was checking this for a weekend I planned, with very detailed hour to hour schedule. It showed most of them in the wrong place, e.g. lunch at 23:00 in the evening. When opening and closing the task (changing nothing else) it worked correctly. @Sebastian Grede: Thank you for letting me know! I've re-opened this thread, and I'll let you know as soon as I have an update! @Sebastian Grede: We have resolved the issue with statuses not being in sync in a recent update! We are still looking into this issue with the list date. @Jorgen: Hy did you release the update already? The statuses are still no synching on my site. @Sebastian Grede: Hmm. Can you let me know if you're still experiencing this issue in a new private / incognito window? @Sebastian Grede: Hey there! It is possible this is caused by an issue connecting to our realtime server. 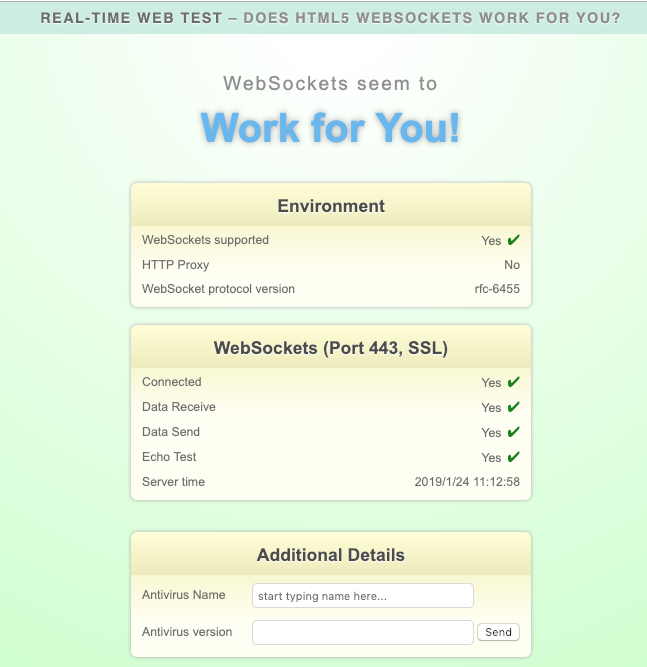 Could you let me know the result of this websocket test https://websocketstest.com/ ? You should see "WebSockets seem to work for you". We have resolved the issue regarding the Gantt chart percentage. To complete this update, please refresh the page. Thanks for your help in getting this bug fixed, and as always, let me know if there's anything else I can help you with! Hey there, Sebastian! We have resolved the bug with task titles in a recent update. I'll be sure to update this thread as more fixes are released. Hey there, Sebastian! Thank you so much for the looms. That really helps us track these issues down. I've passed this along to the engineering team, and I'll let you know what I hear back!